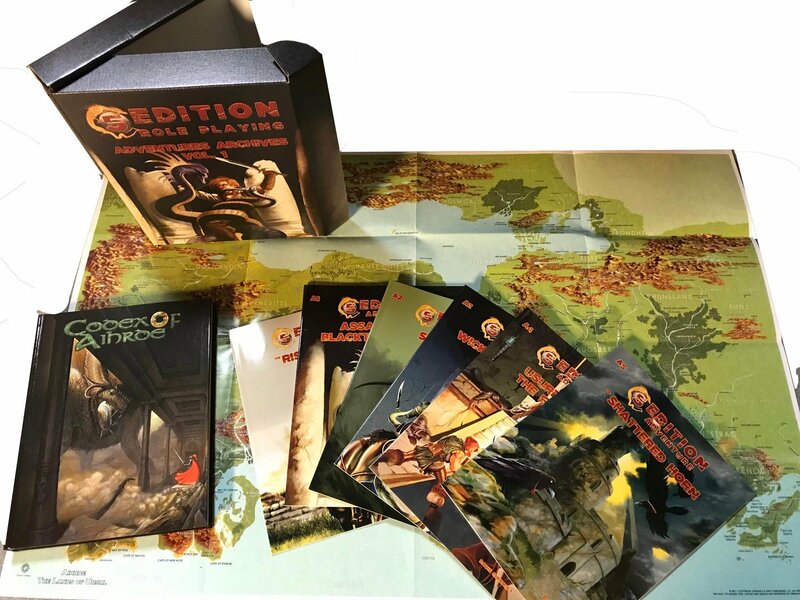 This boxed collection includes 6 5th Edition Adventures and the Hardcover Codex of Aihrde world setting book and a full color, fold out world map. A 30% savings! Curious about Aihrde: Check it out! The adventures are A0 Rising Knight, A1 Assault on Blacktooth Ridge, A2 Slag Heap, A3 Wicked Cauldron, A4 Usurpers of the Fell Axe and A5 Shattered Horn. All designed for play from adventure levels 1-5. The adventures include overland, dungeon, and city, pitting your characters against goblins, bandits, trolls and more! Play in a series or as stand-alone adventures! The Codex of Aihrde, a 280-page full color hardback book, includes everything you need to get started adventuring in one of the most expansive ga­me settings you'll ever enjoy. In the first part, the Andanuth, you learn the story of Aihrde, from its uttermost beginning to the present age. It follows the journey of All Father, the creation of the gods and the world. The story covers the creation of the people and more and all their long journeys and travails from their arrival to the realms of the day. The Andanuth is generously sprinkled with stories and tales of gods and men, dwarves and goblins, war and peace. You'll not wonder what happened before...you'll know. In the second part, the Almanac, you dive into the particulars of the gods, the people, countries, places and realms of Aihrde. There are over 50 gods outlined for play, a dozen peoples including all your favorites (dwarves, elves, men, halflings, gnomes, orcs, goblins, giants, trolls, dragons and more). Each of 30 plus realms are intimately detailed with history, government, economy, military, present rulers and other specific information. Beyond that we have terrain that is detailed as well.